Tiani Cook resembles a real-life cowgirl from one of those vintage Hollywood Westerns. Like Barbara Stanwyck as Annie Oakley or glamourous Gene Tierney as the gutsy Belle Starr. Her waist-length hair is expertly braided, a crisply ironed shirt is paired with an eye-catching neck scarf and her hat is perfectly perched, completing the vision. She is one of the most effortlessly immaculate people I’ve ever met. Though Tiani Cook is not the kind of cowgirl who sits on the sidelines smoothing her skirt while John Wayne and Clint Eastwood gallop in to save the day. 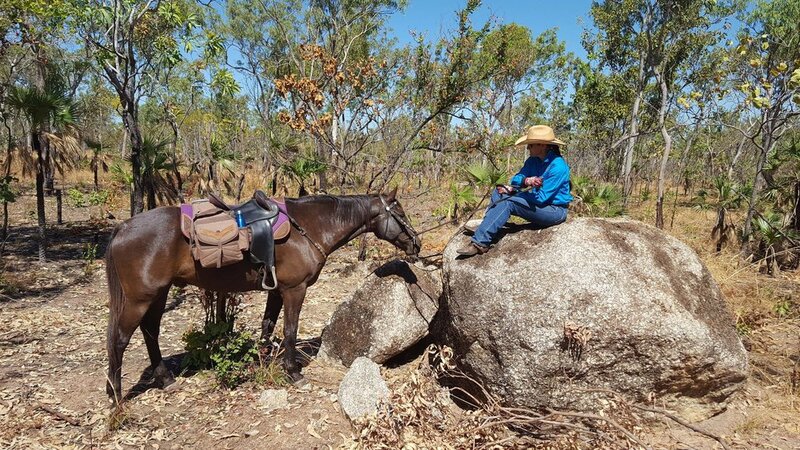 An expert rider and mother of four, Tiani helps run the family’s station, Suplejack Downs, which is 730 kilometres from the nearest town. When she’s not urging for increased regional support through her relentless advocacy work, she’s coordinating her annual charity ride, Horses for Courses, which kicks off this weekend. I caught up with Tiani to learn about the ride and talk about her life in remote Northern Territory. By the time you’ve read this story she’ll be guiding a group of young bush kids along a track from the West McDonald Ranges to Alice Springs. And by the time I’d finished talking to her I knew one thing for certain; Tiani Cook is not a cowgirl of yesteryear, she’s the leading lady in a league of her own. Tiani, can you please tell me about Horses for Courses? On October six, a group of riders will head off from Glen Helen Resort along a route to the McDonald Ranges, arriving on October 12. Through-out the course of the adventure we’ll share stories and participate in fun activities that raise awareness about the lives of bush kids and the issues they face. This year we’re dedicating our ride to a very special cause, the Dolly’s Dream Foundation. Can you please describe the course route? It was a natural fit for the purpose and we’ve had amazing support from the National parks involved. They’ve helped with permits and all elements required to make this ride work. To be honest, the operations and the administration is more difficult than the ride itself. The scenery the participants will observe along the way is breath taking, the gorges and the gaps in the red ranges are extraordinary. When the sun rises and sets against the ranges, illuminating them, it’s just the most spectacular sight to see. How many people are participating this year? This year we’ve got about 20 riders, including support crew, who provide the camping set up, the bedding, horse feed and everything in the support vehicle. They meet us along the way and when we get to camp it’s all hands-on deck as we have to set up the camp and get all the meals prepared. On Thursday we’re looking forward to a meal that the CWA are kindly making for us. They’re going to cook a delicious dinner for everybody! Where did the idea for ‘Horse for Courses’ come from? My Grandfather did a lot of droving trips through the Territory, droving mobs of cattle, and originally, I wanted to drove cattle. A friend came out to visit me and explained how she rode through Guy Fawkes National Park. I’d always wanted to coordinate a trail ride through our region so, we decided to do it! Lots of people wanted to volunteer as support crew on the ride. The experience was incredible but it wasn’t without challenge being an endurance ride. This year the distance is much shorter (only 20 to 30 kilometres every day) and we’ll get into town in time for the Alice Spring Masters Games, which I’ll be show jumping in. How can people support Horse for Courses? Your backstory is really interesting. Can you please take us back to the start? I grew up in central Queensland and then we came out here to Suplejack, the home station, settled by my grandparents in 1964. At the time, my grandparents were running the station, and we came out when I was in grade three for a couple of years. I was educated by School of the Air before we went back to Queensland. Mum had brothers, but they didn’t want to take it on, so in 1996 we moved back to Suplejack permanently. I’m the eldest of seven children and over the years we have all lived here on and off. At the moment it’s my family, my brother Cameron and his children and my parents. Other people live here during the mustering season, but outside of that it’s too hot so you don’t move cattle. Last season we had a really dry season and we only received half of the annual rain fall in wet season. Can you please explain the living layout on the station? The main homestead was built seven years after my grandparents first moved out here. They initially lived in a tent when they arrived, then in a tiny shed and my grandma cooked on an open fire. From the outside the homestead looks like a huge shed but on the inside it’s all lined like a house with multiple rooms. My house was built about twelves ago, there are three other houses, couples quarters and the singleman’s quarters, which includes six single rooms. As it’s a family run station we all congregate at the homestead for breakfast, lunch and dinner when we’re all at home. I cook for everyone, in the middle of the mustering season it can be up to 30 people I’m catering for. Normally, I’ll put a shopping order online and then someone will go into town for something and they’ll pick it up. It takes us nearly nine hours to get to our closest town, Alice Springs, so when we’re there we get all the jobs done in one trip. How do you make the food last the distance? Planning. You organise a couple of evening meals with rice, pasta, veggies and we obviously have all our own beef. We also have a market garden and I grow all our own vegetables. In the mornings I’ll head over to the homestead by 630am as the men work from 7am. However, in the middle of the season they’re gone by 6am. I’ll come over half an hour before and cook a big batch of scrambled eggs. I also do a big porridge in the winter and then I’ll pack lunches if they’re out for the day, which involves corned beef and salad sandwiches plus a piece of fruit and muesli bar. If they’re back at the homestead we’ll have morning tea (a cup of tea and cakes) at 10am. For lunch everyone comes in and I’ll do meats, salads and a big potato bake. In the evenings, every night, we have beef! We cater for all requirements, but beef is a stable given we grow it. Can you please talk me through the station operations? Every year we have mustering season where we bring the cattle in to make sure they’re vaccinated and healthy. The weaners are taken off the cows, so the cows can recuperate and then the weaners are brought together and taught handling. This is where we teach them to mob up, feed them hay for two days and take them out on horses. We sit with them all day, bring them in for a drink at lunch and then take them back out to feed on grass. This helps them get used to the horses as they only see humans and horses a few times a year. We handle them for about ten days, and then we walk them back out to their paddocks. We might have two to three mobs of weaners each season which is roughly 2000 to 3000 in total. We organise the cattle in-line with the market so if we know a certain size of male beast is sought after we’ll make sure that paddocks is mustered and ready to go. Outside of the mustering, the day to day tasks include bore runs, breaking in horses, building, infrastructure, maintenance or fencing…we have 50 kilometres of fence-lines, so it keeps us busy! What’s it like to raise children on a station? All four of my children were educated by School of the Air and the Northern Territory School of Distance Education. To learn, they sit in front of a computer and participate in an Interactive Distance Learning lesson, similar to skype. They’re able to see a teacher and can see their class mates, day in and day out. My teenage girls get a bit lonely because they don’t have after school sports or weekend sports. We discussed boarding school, but they have all their animals and the things they love here so they decided they didn’t want to go away. You weigh it up as a Mum, you think about them being homesick but there is also the element of them engaging with other kids that you think about too. I’m also acutely aware of bullying. All said and done, their social life can wait until University days. My eldest is 22, she lives in Alice Springs and my second eldest is working on the station. He’s a talented bull rider, his grand plan is to work at the station and then he’ll head to the states to become a professional bull rider. My other two are in grade 10 and 12, I think they’ll work on the station for a year and then decide what to do at University. There are huge issues around education and feelings of social isolation that children on remote properties experience. That’s why Horses For Courses is great because it brings children together to share information, exchange stories and interact. My intention is to keep it growing so the children can share the adventure and their stories with people in bigger centres. The kids and I have always lived rurally, they’re bush kids. I split up with their father 13 years ago, so I educated and raised them on my own. Is it difficult to date someone when you’re living remotely? Well you can’t exactly just pop into town to go on a date when you live nine hours away! When my youngest has made the decision to leave home, I’ll think of myself. The roads are pretty bad in the wet season so you’re doing repairs on your car every time you go to town. Any prospective suitor is going to need decent mechanic skills and will have to enjoy long road trips! You’re such a strong, fearless female, it’s very inspiring. I’m a Northern Territory board member of Australian Women in Agriculture and I’m part of the national rural women’s coalition, so I’m a huge advocate for women in ag. I proactively support women who are passionate about a career on the land or aspire to be a pastoralist. We have such a supportive family unit and environment so in my case, we’re treated equally. We’ve always been encouraged, and we’ve never been told that we can’t do anything just because we’re female. Some physical work is better suited to the men but industry innovation and technology has changed the dynamic. We have hydraulic head bales and calve cradles which reduces manual labour. However, our lives out here are different. There are no beauty therapists out here! You don’t even get the opportunity to soak in a bath, you just dive through the shower! You work long, hard hours and you have to be a nurse, a vet, a horse-breaker, a cook, a teacher. It’s the epitome of jack of all trades and master of none when you live out bush! What do you love about living out bush? I love the freedom, the space and the time you create for yourself to take it all in. A couple of my favourite things include being able to ride my horse whenever I want to and being able to raise my kids in the expansive environment. The other thing I love about being on the land is that you have this innate feeling of being connected. You connect to the environment, people and the wildlife. I think people on the land have a deep sense of empathy. I cherish that. You learn how to read body language by working closely with the body language of animals, they tell you a story without words. You learn to pick up unspoken stories, and I think that’s really special.